Matt takes in the view from the Inn of the Sea at Yellow Point. A lovely moment with Sarah at Kiwi Cove Lodge in Ladysmith. Such happy love. I just couldn’t get over these two. Thanks for that, Matty. I feel, uh . . . enriched with the experience. Not only did the The Crow and Gate Pub in Cedar have phenomenal food, but its grounds were spectacular. One of the many moments which makes me so happy to be who I am, where I am, doing what I do. Motorcycle helmets: notoriously difficult to kiss with. Is it Daft Punk getting married? No! 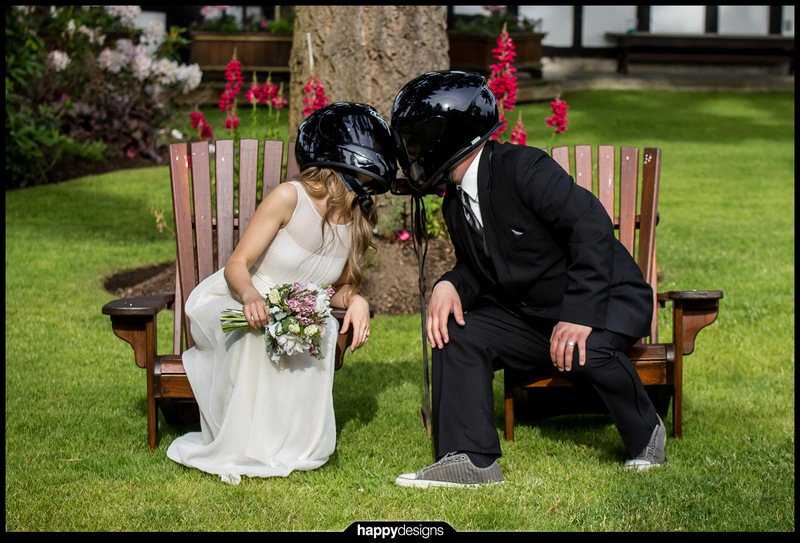 It’s my wonderful couple abiding to my request of formals + motorcycle helmets. Such amazing contrast of formal and formidable, yet it all goes together, no?